In yet another sign that student loan debt in the U.S. is in a bad way— you know, beyond the fact that we as a nation owe about $900 billion in outstanding debt — low-income students who received Perkins loans to get through college are defaulting at such a rate that their former colleges and universities are suing them to recoup the money. While there aren’t any numbers citing exactly how many schools are suing Perkins borrowers, a record number of former students defaulted on their loans in 2011, for a whopping total of $964 million, reports Bloomberg. That’s 20% more than in 2006. Not only do those defaults create a headache for schools like Yale, George Washington University and the University of Pennsylvania, all of which have sued former students over nonpayment, but often those funds are redistributed to new students via the Perkins program. If students aren’t able to find work and pay back their schools, that means less money in the pool for prospective students seeking financial aid due to financial hardship. “Perkins loans are issued from a revolving fund, so any monies recovered through litigation increase universities’ ability to help other students with education costs,” a spokeswoman for George Washington University told Bloomberg. Despite the fact that these colleges and universities aren’t the for-profit schools being sued in states like Kentucky over claims they weren’t provided useful educations or help with job placement, some students say they simply can’t find full-time work and can’t afford the payments. And if they owe money for private loans, they might be more likely to pay those back first due to their higher interest rates. Perkins loans come with a low 5% interest rate and nine-month grace period after graduating, but there are no payment plans to help borrowers who may be in a tough spot financially. For example — one student sued by George Washington graduated in 2010 and later defaulted on $4,000 in Perkins loans. He earns $800 a month from teaching high-school equivalency courses and restores basements for extra money. 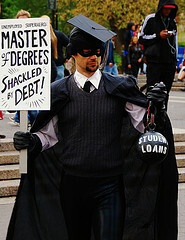 He said he is trying to pay off other student loans first because they were co-signed by his parents. Defaulting on a Perkins loan can get very pricy once the school moves from warning a borrower to debt collectors and finally, the courts. Federal law says schools must attempt to collect unpaid Perkins money, said Yale spokesman, if the account is at least 120 days past due. Then it can go to collections, which can be very expensive as the government allows universities and debt collectors charge higher collection fees than they might on a Stafford loan: Schools can charge 30% of the loan principal as well as interest and late fees on the first attempt, 40% on the second try and another 40% on litigation. It’s somewhat of a vicious cycle, as the associated director of student financial support for the University of California system points out. After all, Perkins loans are given to the most at-risk students, and “they may have the least ability to pay it back,” she said. She adds that the UC system tries to work things out with debtors first because balances are usually pretty small. And if there’s no money or assets to be awarded, why do sue? Things could change for the better for students, as President Barack Obama President says he wants to get more loans to working-class families and increase the Perkins pot from $1 billion to $8.5 billion. And instead of schools services the loans as they do now, the Education Department would take over that duty. Just a reminder for our Consumerist readers who have questions for the Consumer Financial Protection Burea’s student loan ombudsman Rohit Chopra — you can email your questions to tips@consumerist.com with the subject line “DEAR ROHIT” and we’ll post the responses in the coming weeks.